THE FINAL DAY OF THE RIDE started out perfect – sunny and not too hot – and pretty much continued that way throughout. With a light ride of “only” 65 miles and traveling on mostly familiar ground, it promised to be a good day. And it was, mostly. Flat, smooth roads and low traffic made the ride itself very pleasant. The overall experience, however, turned out to be a set of alternating ups and downs. Odd, indeed. 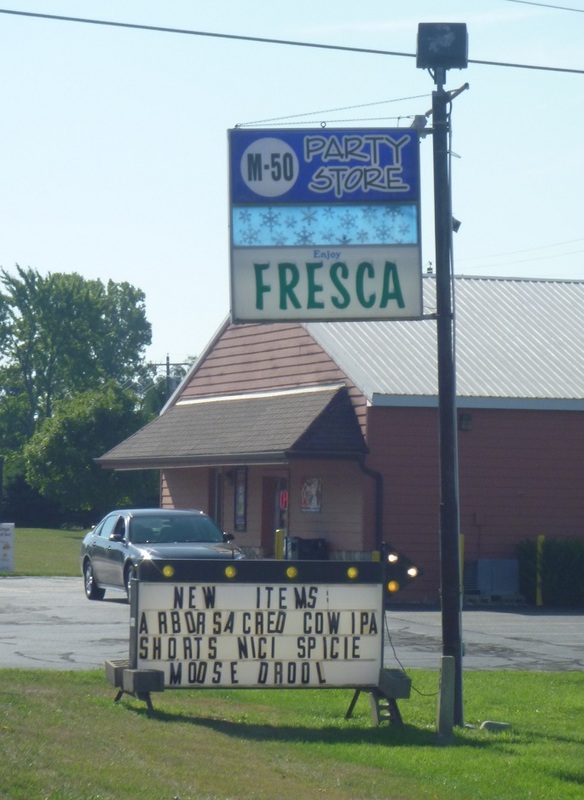 When was the last time you saw a sign advertising FRESCA? The first leg took me back along M-50, which is a fast road but had a decent shoulder. And when I saw the store pictured here, I just had to stop, if only to find out what “Moose Drool” was and how you could possibly sell it. Turns out it’s a Michigan beer, one of many local brews this store carries. But even if I drank a lot of beer, that name wouldn’t appeal to me much. Dragons and flying monkeys, on the other hand, I just had to get – for my D&D group, of course. (Click to see the labels better.) 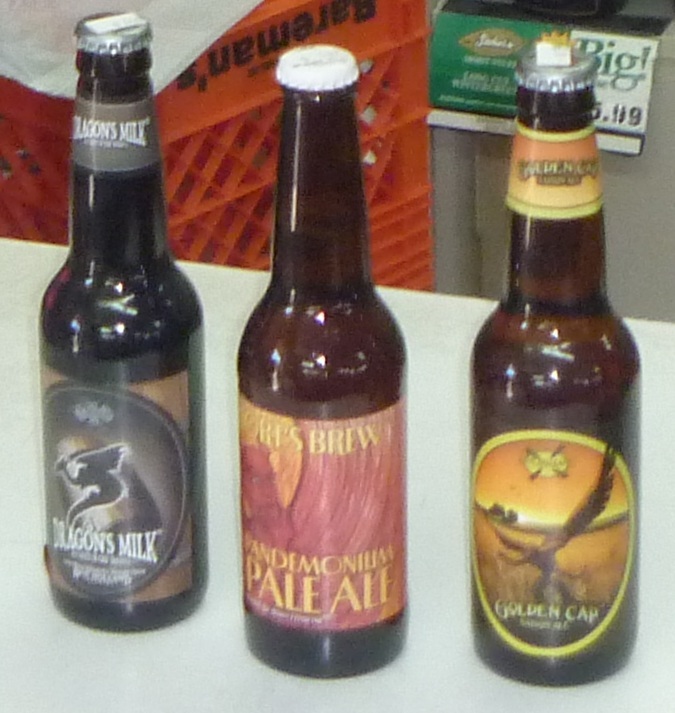 FYI, “Dragon’s Milk” is a dark, full flavored beer reminiscent of Guinness. Eaton Rapids, my first planned stop, meant a mandatory visit to Hamlin Square Coffee for a chocolate chip scone and first-rate cappuccino. The baristas there, Aron and Andrea, recognized me and we shot the breeze awhile. Andrea told me she’s lost over 10 pounds this summer by riding her bike more and changing her diet. Great going, Andrea! For a reason I forget, Aron mentioned Onondaga. “There are two bars there,” he said, “and all these people talk about going to Onondaga just for the bars.” He didn’t know why. I didn’t think much of it until, back on the road, I saw a sign for Onondaga just two miles south. So I took a detour. It was noon on Sunday, but I could at least look at the bars and maybe ask someone what the fuss was all about. I hoped my next stop in Leslie would be better, but the shops were closed and the streets were deserted. I took a few minutes to ride around anyway, and on one of the back streets I found what remained of a town-wide weekend garage sale. I browsed for a bit and found a book on desserts (naturally) with a recipe for chilled lemon mousse, which is on my list to make. My panniers were stuffed, but somehow I got the book in there. I promised Brittany (shown here holding my bike) I’d let her know how the recipe came out, and I’ll post it here as well when I get the chance to make it. On to Stockbridge and the Cravingz Cafe, where I’d stopped on Day One. Alas, they had closed an hour earlier. So no coffee until Chelsea – could I survive 13 more miles without it? And would the Gourmet Chocolate Cafe still be open? I texted my wife and daughters just in case; Tori’s reply, “You can do it!” inspired me to tough it out. Tragedy! The GCC was closed. Fortunately Chelsea’s other cafe, Zou-Zou’s, was still open, and I remembered that it was popular with cyclists. 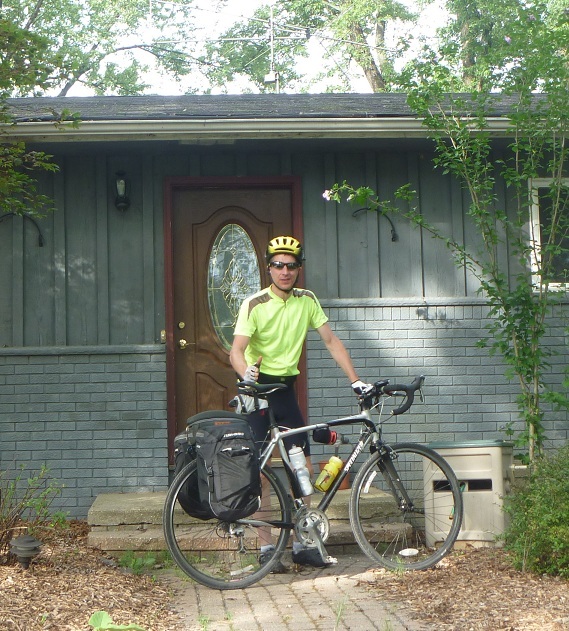 As I’d thought about that morning, I’d spoken with all kinds of people during my trip – except for other cyclists. How’s that for irony? 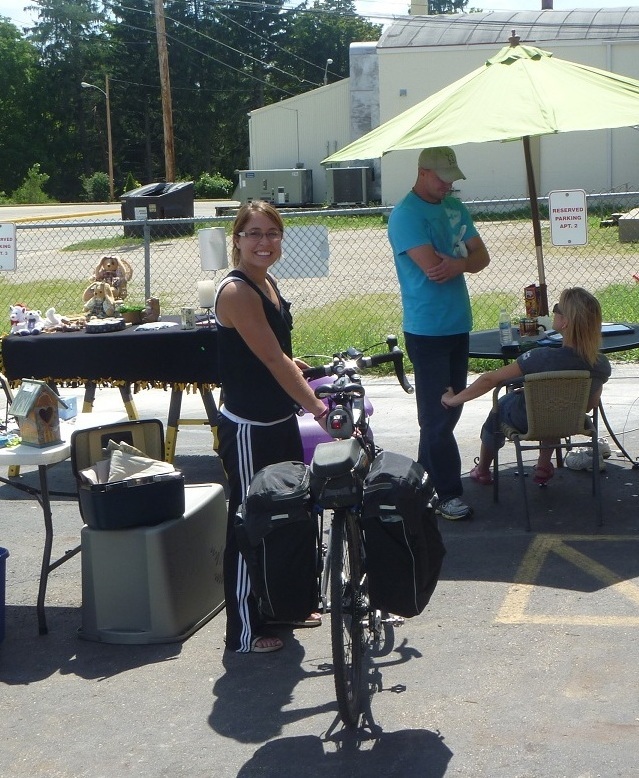 And as it happened, there were several other cyclists hanging out at Zou-Zou’s, and I had fun talking with them. 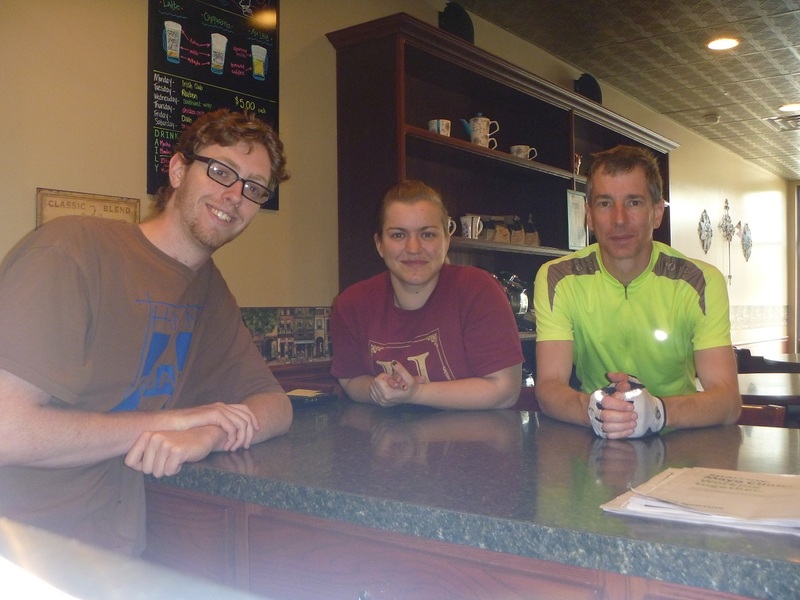 I rode from Chelsea to Dexter with a local couple, Curt and Joey, who told me about Mr. B’s Joybox Express, a jazz group that raises money for supporting participation of children in arts and athletics. 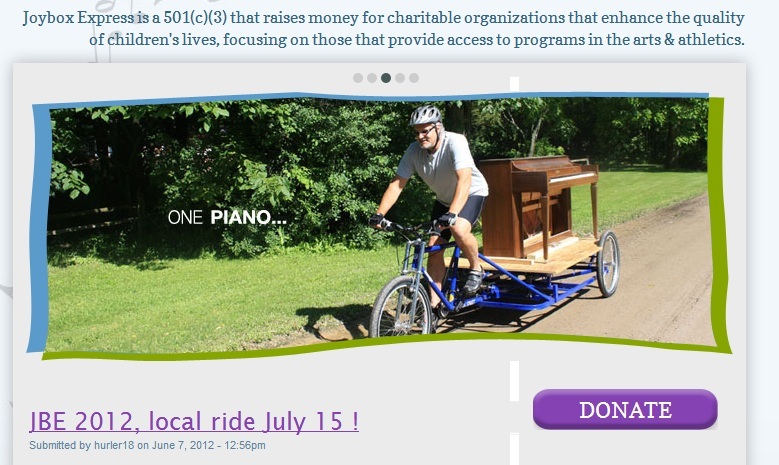 As the picture shows (taken from their website), they travel by bicycle, carrying or towing their instruments – including their piano. Their next big tour is down the Mississippi River. From Dexter it was a short hop back to our house, where I’d started out two weeks before. A bit anti-climactic, as no one else was home except for our three cats, who were more interested in getting their dinner than in where I’d been. But it was good to be home. Mission accomplished! 6 1/2 days, 610 miles.